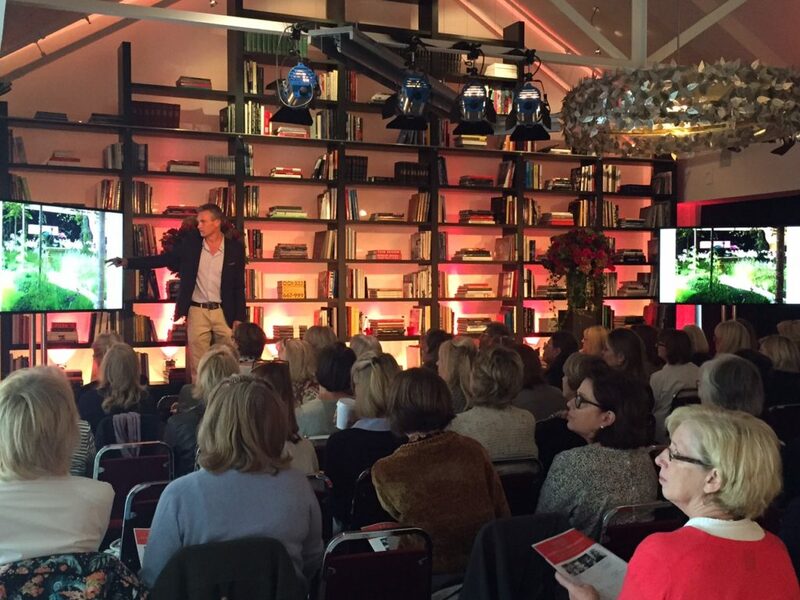 Hosted by House & Garden editor Clare Foster the Reader Day 2016 celebrated the latest in garden design and floral artistry. The packed programme included a host of inspirational talks including an illustrated talk by award-winning garden designer Richard Miers, an interview with landscape architect Huw Morgan and a lesson in floral artistry by Melissa Alexander of JamJar Flowers. Richard Miers has been designing gardens for nearly 20 years and his work has taken him from all over the world including a dacha in Moscow, a villa in Sardinia and numerous gardens in and around London and the home counties. Being rooted in tradition, his gardens are harmonious and handsome with a strong sense of geometry. Richard explained his garden planning philosophy, which begins with structure, whether it is with hedges, walls, paths, trained fruit trees or a whole avenue of trees, and always includes symmetry. Huw Morgan is regarded as one of London’s best creative consultants with a background in landscape architecture and external design. He has most recently brought botanical beauty to Canary Wharf at EcoWorld Ballymore’s Wardian London for which he has created an urban oasis with a landscape public plaza featuring more than 100 species of plants and flowers and extensive ‘sky garden’ balconies. Former director of Take 2 Model Management and now director of bespoke flower company, JamJar Flowers, Melissa Alexander represented a host of top models including Natalia Vodianova and Sophie Dahl before turning her attention to flowers. She has, however, found similarities in her new career. She says, for example, that, ‘If models and flowers are not happy, they do the same thing – their heads start to droop’. Melissa demonstrated the art of flower arranging while talking about her work. There was also the opportunity to purchase arrangements from JamJar Flowers.